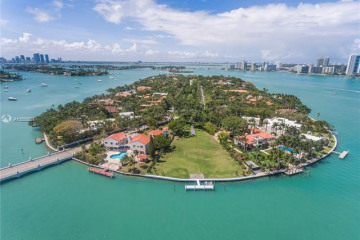 Known for its waterfront lots and celebrity residents, Star Island real estate is a man-made island on South Beach that’s just a bridge away from the action. Initially developed by Carl Fisher in the 1920s, Star Island is accessible via the MacArthur Causeway. Though guard-gated, the island is open to public access and contains a single, oval-shaped street aptly named “Star Island Drive”. Homes are all situated on waterfront lots, while beautiful Buoy Park runs along the interior of the island.